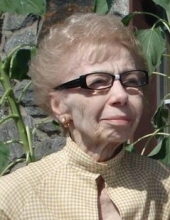 Ruth Engelmann, 94, of Roselle Park, NJ, died peacefully on Monday, January 14, 2019. Born in Germany on December 17, 1924, Ruth was the daughter of the late Karl and Hilda Engelmann. She worked for Bell Labs for many years, then received her master’s degree in teaching from Columbia University. She taught at the University of Wisconsin, Princeton University, and the Montgomery Twp. School system. Ruth is predeceased by her brothers, Fred Engelmann and Gary Engelmann, and is survived by several nieces, nephews, great-nieces and great-nephews. Funeral services will be held on Friday, January 18, 2019 at Holcombe-Fisher Funeral Home, 147 Main Street, Flemington, NJ. Calling hours are from 10:00-11:00, followed by a funeral service at 11:00. Interment to follow at Prospect Hill Cemetery in Flemington, NJ. "Email Address" would like to share the life celebration of Ruth Engelmann. Click on the "link" to go to share a favorite memory or leave a condolence message for the family.